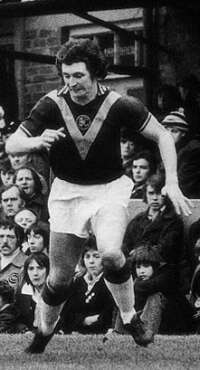 He made his debut in March 1971 after signing from Bolton Wanderers for £60,000, then Burnley's transfer record, and played his last game in November 1979. 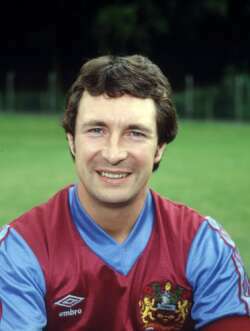 Known to many as ‘The Kestrel' for his ability to hang in the air when going up for a header he came close to winning England caps as Burnley climbed back amongst the top clubs for a short time in the middle of the decade. He moved on to Blackpool before a broken leg ended his career, just as he was on the verge of another transfer. He wasn't out of the game long though and has since been heavily involved in the development of some of English football's new stadia. This week the Huddersfield Examiner looked at Paul's life in football since his playing days ended, the article is reproduced below. PAUL FLETCHER has spent almost as long developing stadiums as playing in them. He masterminded Bolton's Reebok project, took charge at Wembley and was then the guiding light for Birmingham's national stadium bid. Now, the 51-year-old former Burnley player is to forefront Coventry City's £130m leisure development in which the First Division club will have a 32,500-seater soccer stadium. It's all a far cry from when Fletcher helped Colne Dynamoes catapult from nowhere to become one of the best known non-League clubs in the country at their own Holt House ground. Ask Fletcher to pinpoint his most coveted achievement in the intervening 13 years, however, and he has only one answer: the McAlpine. "My time working in Huddersfield was some of the happiest of my career and the McAlpine Stadium is very close to my heart," said Fletcher, who left to join Bolton, his first club as a player, in 1996. "It was the first of the new generation of stadiums and, in my opinion, it is still the best. "People always assume I will say the Reebok is better, but that's not the way I look at it. "With a new stadium and associated developments, it's firstly about what you deliver to the fans and, secondly, how everyone works together to bring that about. "While I loved working on the Reebok, the fact is that the stadium is miles from cobbled streets, corner shops and the heart if the community. "The McAlpine achieved all that on virtually the same site as the old Leeds Road ground, everybody was so helpful in bringing the whole thing together and it is still very much a facility for the whole community. "We had a lot of luck at the time, of course, because Town got on a roll and crowned their first season at the stadium with promotion, but such a lot of work went in from all quarters to bring the necessary finance and expertise together that we were able to create something which will stand the test of time." Fletcher, who lives in Rawtenstall, Lancashire, and is a professional speaker these days, is widely recognised as a leading consultant on stadiums. It was in 1988, after a 15-year playing career which earned him England Under 23 honours, that he first became involved at Colne, from where he joined Town as chief executive two years later. In 1992, Fletcher was moved to work full-time on the McAlpine project and his experience is second to none ever since. "Coventry is another new challenge for me and sustains a lifetime in the game despite the fact I've never been a manager or coach," he said. "I'll be chief executive of their project team and in addition to the stadium, there will be a 12,500-seat arena and, between the two, a covered atrium for conferences, banqueting and exhibitions. "The total cost will be about £130m and it should be finished in 2004, although a specific date is hard to gauge. "Around three quarters of the funding is in place but, in the next few months, we are looking to secure the final part of the financial package to add to the planning permission which is already there." Fletcher's most recent appointment was to the Birmingham national stadium bid, which is still hoping to get the Government and FA nod ahead of a redevelopment at Wembley. He believes Birmingham is undoubtedly the best site - providing 20,000 car park spaces alongside the NEC - but he explained: "The FA and Government have a tiger by the tail with Wembley because they have spent so much money on it that they are nervous about walking away. "It's my view the national stadium should be in Birmingham on what is an ideal site, and when you consider that 75% of football fans in this country live north of Watford it makes sense. "Indeed, when a survey of fans was carried out, 67% voted for Birmingham to have the national stadium, so it will be sad if they end up going to Wembley and building down what is effectively a massive cul-de-sac."